Do you have money struggles? I doubt very seriously if you would answer this question honestly. Why? Because there’s a lot of shame that goes along with financial struggle. No one wants to tell people their money problems. We tend to place our value and worth on how much money we have or don’t have. And yet, so many female entrepreneurs and business owners are constantly on the up and down money roller coaster. You work hard everyday building your business and at the end of the month, you have very little money to show for it. I understand this struggle all too well. One month I would earn great money in my business and then all of a sudden my income would drop back down to where I could barely meet my financial obligations. Or when I did have money, something always happened to drain my bank account. The car would break down, the pipes in the house would burst or the air conditioner would stop working. It was one unexpected expense after another. This is a constant issue for many women entrepreneurs who find themselves in financial trouble. You tell yourself that if you could gain more visibility, get more customers, charge more for your products and services that you would increase your income. So you get busy working, going to every networking event, speaking on anyone’s stage who would ask you, posting all day on your social media platforms, doing live videos, sending out emails and press releases…only to find very little revenue gains. And you dare not tell anyone because at least you look successful and prosperous. Your website is beautiful, your business cards look expensive and your brand has all the bells and whistles. You believe you can fake it until you make it. But the truth is, you feel like a fraud who is not living your truth. I’ve been an entrepreneur for over thirty five years. Yet, I have not always been financially successful. On the outside, it appeared that I was flourishing, but internally my company was always on a constant up and down money roller coaster. I thought this was a personal failure on my part. But I soon discovered it was something much deeper. It was only when I became sick and tired of being sick and tired that I identified my internal money wounds and leaks. My defining moment came when I discovered that I had some deep invisible, hidden barriers, blocks and beliefs that were preventing me from experiencing a consistent money flow into my life and business. I had money issues and they were deeper than I’d realized. When I stopped denying the truth about my money wounds and traps, and learn new skills to breakthrough them…my business and finances began to flourish. 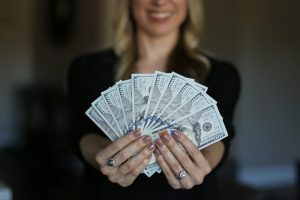 Not only did I learn new money management skills, but I also uncovered the hidden controlling beliefs that literally sabotaged and prevented me from awakening unto my wealthy place. I learned how to breakthrough these beliefs, barriers and blocks to my wealthy place and I transformed my relationship with money. Many female entrepreneurs remain in a space of not enough, survival, defense and struggle around money. Is it because they don’t know how to solve it? Truth is, they refuse to do something different and they don’t know what that something is. They don’t know how to go behind the screen in their mind to make the internal shifts that’s needed to create external results. This is why I am so pleased to invite you to enroll in The Awaken Your Wealthy Place Program designed to help you break the patterns that have been pushing money out of your life and business. This program will offer you the tools and insights to release and remove the beliefs and behaviors that have prevented you from achieving the kind of financial success you deserve. If you’re finally ready to shatter your money shame and willing to make the shift from “Just Enough”, “Not Enough” to “More Than Enough”, then enroll now! Let’s get started now, learn more here.